Most targetoid hemosiderotic hemangiomas do not exhibit a targetoid appearance. An older waning lesion is presented showing a 2-toned papule with a dark brown center surrounded by a tan-brown rim. 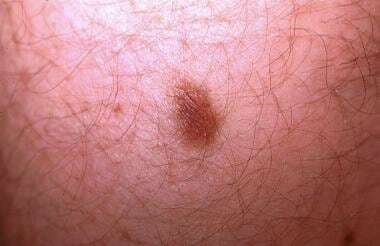 This clinical image can be confused with a melanocytic nevus or dermatofibroma. This 20-year-old patient described episodic changes that varied from a larger violaceous papule surrounded by an erythematous halo (target lesion) to the illustrated lesion. Targetoid hemosiderotic hemangioma mimicking nodular malignant melanoma. Note the dark black papule surrounded by a faint brown rim. A second theory suggests that trauma disrupts vasomotor enervation. This leads to an inability to regulate blood flow and results in progressive vascular ectasia, which is characteristic of targetoid hemosiderotic hemangioma. This scenario also has been postulated as a mechanism contributing to the development of acquired port-wine stains. No documented aberration in nerve fiber density in targetoid hemosiderotic hemangioma exists to support this theory. These studies examining vessel origin have revealed microshunts between lymphatic channels and small blood vessels that may well explain many of the histologic features of targetoid hemosiderotic hemangioma, such as aneurysmatic microstructures (telangiectases/lymphangiectases) and erythrocytes within histologically apparent lymphatic spaces. The hemolymphatic nature of targetoid hemosiderotic hemangioma would also explain the clinicopathologic overlap with solitary angiokeratoma, an acquired vascular tumor that is also suspected to arise secondary to trauma and is characterized by superficial dermal dilated vessels (telangiectases). Trauma is the only known predisposing factor for targetoid hemosiderotic hemangioma (THH). [14, 15] Reports of targetoid hemosiderotic hemangioma secondary to irritation from a belt and arthropod assaults exist. Histologic findings of foreign body giant cell reaction in a few cases points to a preceding injury. Episodic changes of enlarging and diminishing hemorrhagic/hemosiderotic halo also implicate recurring trauma or vessel fragility. Hormones can influence clinical morphology, resulting in the cyclic changes of waxing and waning diameter and peripheral color. Estrogen is believed to mediate pregnancy-related vessel changes, such as spider telangiectases, and estrogen is known to promote vascular permeability and fragility, venous distensibility, increased blood flow, and vasomotor instability. In targetoid hemosiderotic hemangioma, fluctuating estrogen levels may result in vessel instability and leakage. Of note, hormonal receptors have not been identified histologically in lesions of targetoid hemosiderotic hemangioma noted to cyclically change with the menstrual cycle. Prevalence is unknown. Targetoid hemosiderotic hemangioma represents less than 0.1% of solitary pigmented lesions presenting to the Albany Medical College pigmented lesion clinic. From a dermatopathologic perspective, the Albany Medical College Dermatopathology service identified 33 cases out of more than 90,000 (0.1%) dermatopathologic accessions over a 3-year period. Global incidence of targetoid hemosiderotic hemangioma is unknown but presumably is similar to that observed in the United States. No known racial associations exist, although THH has been reported only in whites. Males appear to be affected more frequently by targetoid hemosiderotic hemangioma than females (male-to-female ratio of 1.4:1). Episodically changing targetoid hemosiderotic hemangiomas have been described more frequently in females than in males. In targetoid hemosiderotic hemangioma patient age varies from 5-72 years, and most patients present during their 20s and 30s. Because targetoid hemosiderotic hemangioma can mimic malignant skin tumors, advise patients who have had a targetoid hemosiderotic hemangioma to seek medicodermatologic consultation should they find another similar lesion on self-examination. Santa Cruz DJ, Aronberg J. Targetoid hemosiderotic hemangioma. J Am Acad Dermatol. 1988 Sep. 19(3):550-8. [Medline]. Carlson JA, Daulat S, Goodheart HP. Targetoid hemosiderotic hemangioma- a dynamic vascular tumor: report of 3 cases with episodic and cyclic changes and comparison with solitary angiokeratomas. J Am Acad Dermatol. 1999 Aug. 41(2 Pt 1):215-24. [Medline]. Joyce JC, Keith PJ, Szabo S, Holland KE. Superficial hemosiderotic lymphovascular malformation (hobnail hemangioma): a report of six cases. Pediatr Dermatol. 2014 May-Jun. 31 (3):281-5. [Medline]. Trindade F, Kutzner H, Tellechea Ó, Requena L, Colmenero I. Hobnail hemangioma reclassified as superficial lymphatic malformation: a study of 52 cases. J Am Acad Dermatol. 2012 Jan. 66(1):112-5. [Medline]. Al Dhaybi R, Lam C, Hatami A, Powell J, McCuaig C, Kokta V. Targetoid hemosiderotic hemangiomas (hobnail hemangiomas) are vascular lymphatic malformations: a study of 12 pediatric cases. J Am Acad Dermatol. 2012 Jan. 66(1):116-20. [Medline]. AbuHilal M, Breslavet M, Ho N, Taylor G, Pope E. Hobnail Hemangioma (Superficial Hemosiderotic Lymphovascular Malformation) in Children: A Series of 6 Pediatric Cases and Review of the Literature. J Cutan Med Surg. 2015 Oct 16. [Medline]. Folpe AL, Veikkola T, Valtola R, Weiss SW. Vascular endothelial growth factor receptor-3 (VEGFR-3): a marker of vascular tumors with presumed lymphatic differentiation, including Kaposi's sarcoma, kaposiform and Dabska-type hemangioendotheliomas, and a subset of angiosarcomas. Mod Pathol. 2000 Feb. 13(2):180-5. [Medline]. Martin RA, Howard FM Jr, Salamone CR, Reese DF. Spinal cord vascular malformations with symptoms during menstruation. Report of two cases. J Neurosurg. 1977 Oct. 47(4):626-9. [Medline]. Morganroth GS, Tigelaar RE, Longley BJ, Luck LE, Leffell DJ. Targetoid hemangioma associated with pregnancy and the menstrual cycle. J Am Acad Dermatol. 1995 Feb. 32(2 Pt 1):282-4. [Medline]. Ortiz-Rey JA, Gonzalez-Ruiz A, San Miguel P, Alvarez C, Iglesias B, Anton I. Hobnail haemangioma associated with the menstrual cycle. J Eur Acad Dermatol Venereol. 2005 May. 19(3):367-9. [Medline]. Fernandez-Flores A, Manjon AJ, Campo F. Clinical changes in "true" hobnail hemangioma during menstruation. Bratisl Lek Listy. 2008. 109(3):141-3. [Medline]. Tan C, Zhu WY, Lai RS. A recurrent case of targetoid hemosiderotic haemangioma. Acta Derm Venereol. 2008. 88(2):181-2. [Medline]. Ghibaudo N, Lacour JP, Argenziano G, Ortonne JP, Bahadoran P. Fully regressive targetoid haemosiderotic haemangioma. J Eur Acad Dermatol Venereol. 2009 Jun. 23(6):722-3. [Medline]. Adams BB, Lucky AW. Acquired port-wine stains and antecedent trauma: case report and review of the literature. Arch Dermatol. 2000 Jul. 136(7):897-9. [Medline]. Christenson LJ, Stone MS. Trauma-induced simulator of targetoid hemosiderotic hemangioma. Am J Dermatopathol. 2001 Jun. 23(3):221-3. [Medline]. Beale C, Collins P. Estrogen and cardiovascular dynamics. Semin Reprod Endocrinol. 1996 Feb. 14(1):71-7. [Medline]. Morales-Callaghan AM, Martinez-Garcia G, Aragoneses-Fraile H, Miranda-Romero A. Targetoid hemosiderotic hemangioma: clinical and dermoscopical findings. J Eur Acad Dermatol Venereol. 2007 Feb. 21(2):267-9. [Medline]. Sahin MT, Demir MA, Gunduz K, Ozturkcan S, Turel-Ermertcan A. Targetoid haemosiderotic haemangioma: dermoscopic monitoring of three cases and review of the literature. Clin Exp Dermatol. 2005 Nov. 30(6):672-6. [Medline]. Krahl D, Petzoldt D. [Target-like hemosiderotic hemangioma. Further differential diagnosis of Kaposi sarcoma]. Hautarzt. 1994 Jan. 45(1):34-7. [Medline]. Patrizi A, Giacomini F, Savoia F, Misciali C, Neri I. Targetoid hemosiderotic naevus. J Eur Acad Dermatol Venereol. 2009 Apr. 23(4):493-4. [Medline]. Cossu S, Satta R, Cottoni F, Massarelli G. Lymphangioma-like variant of Kaposi's sarcoma: clinicopathologic study of seven cases with review of the literature. Am J Dermatopathol. 1997 Feb. 19(1):16-22. [Medline]. Zaballos P, Llambrich A, Del Pozo LJ, Landi C, Pizarro A, Vera A, et al. Dermoscopy of Targetoid Hemosiderotic Hemangioma: A Morphological Study of 35 Cases. Dermatology. 2015. 231 (4):339-44. [Medline]. Pabuccuoglu U, Ozkara E, Lebe B. Hobnail haemangioma occurring on the nasal dorsum. Br J Dermatol. 2002 Jan. 146(1):162-4. [Medline]. Gutzmer R, Kaspari M, Herbst RA, Kapp A, Kiehl P. Absence of HHV-8 DNA in hobnail hemangiomas. J Cutan Pathol. 2002 Mar. 29(3):154-8. [Medline]. Cheuk W, Wong KO, Wong CS, Dinkel JE, Ben-Dor D, Chan JK. Immunostaining for human herpesvirus 8 latent nuclear antigen-1 helps distinguish Kaposi sarcoma from its mimickers. Am J Clin Pathol. 2004 Mar. 121(3):335-42. [Medline]. Targetoid hemosiderotic hemangiomas are biphasic vascular tumors that show superficial telangiectases, often lined by hobnailed endothelial cells and deeper slitlike vascular spaces. Note the solitary angiokeratomalike change: the irregular epidermal hyperplasia overlying numerous, blood-filled, dilated vascular spaces in which the lumens diminish with descent into the subjacent dermis (hematoxylin and eosin, original magnification X40). Siderophages and extravasated red blood cells are located at the periphery and between the deep dissecting vascular spaces of targetoid hemosiderotic hemangioma. Prussian blue stain for iron outlines the margins and highlights abundant hemosiderin deposition (Prussian blue, original magnification X100). Histologically, targetoid hemosiderotic hemangioma (hobnail hemangioma) can mimic both malignant processes (low-grade angiosarcoma variants) and cutaneous manifestations of systemic disease (Kaposi sarcoma in AIDS). In this instance, the promontory sign of Kaposi sarcoma is replicated by targetoid hemosiderotic hemangioma. Lymphangiectases envelop an arteriole and are surrounded by dilated blood-filled telangiectases (hematoxylin and eosin, original magnification X200). Close-up of a targetoid hemosiderotic hemangioma. Note the ectatic vessels (lagoons) in the central violaceous papule. Solitary angiokeratoma with an erythematous halo (as compared to early targetoid hemosiderotic hemangioma). Histologically, this lesion was found to have deposition of hemosiderin, extravasated red blood cells, lymphangiectases, and focally small slitlike vascular spaces in the reticular dermis similar to that of targetoid hemosiderotic hemangioma. Hobnailed or protuberant endothelial cells characteristic of the superficial vessels of targetoid hemosiderotic hemangiomas. Note the extravasated red blood cells next to the empty and ectatic vascular spaces (hematoxylin and eosin, original magnification X400). Dissecting or pseudoangiosarcomatous vascular spaces of targetoid hemosiderotic hemangioma. Note the absence of marked cytologic atypia and the overlap of endothelial cells that is expected for angiosarcoma (hematoxylin and eosin, original magnification X200).